West coast Surfboard Quiver and Grom Art! 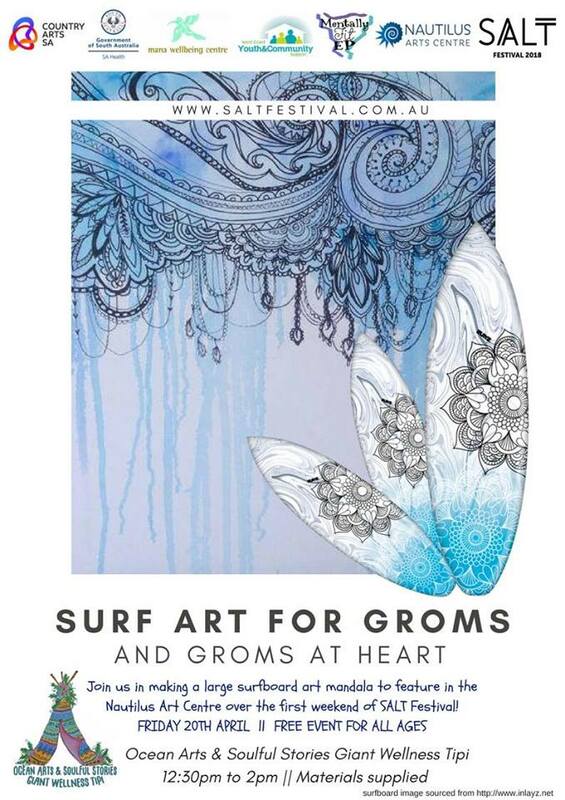 We invite you to be part of our Surf Art Exhibition for SALT Festival 2018 in the Nautilus Art Centre. Our vision is to share a slide show of the Awesome ocean community of the West Coast before our featured surf movie. We may also share a few images via our social media before our main event! Email us an image of … you and your surfboard, boogie board or surf hand plane and flippers. With your name and board dimensions. Thanks to our sponsors “Lincoln Surf” we will have a few gift packs to give away each week as well as a few event tickets to our surf film event! For your chance to be part of that weekly draw March 10th to April 10th simply email us your photo. The weekly winners will be drawn randomly and notified via our social media so keep an eye out! Our Groms (youth) and Grom in heart art! We have a youth section we would love you to be involved in! Giant Tipi FRIDAY 20th 12:30pm – 2pm. Join us in making a large surfboard art mandala to feature in the Nautilus Art Centre over the first weekend of SALT Festival! All materials will be supplied we just need your creative hand and Aloha smiles to join in! This is a FREE event and family friendly GET TICKETS HERE.